In honor of my 5ooth post, I would like to give away one door sweater. I guess I should say that this little give-away is also in honor of Fall. I love the Fall, don't you? I would say that it is my favorite season of all. Now getting back to the give-away. I mentioned that I have not completed all of the door sweaters that I plan on making. I also intend to add a mustard and green to the above mix. 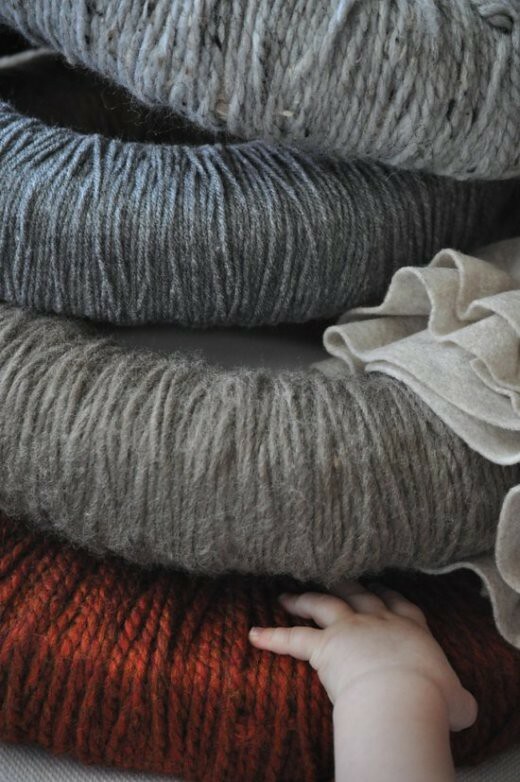 What you see pictured above are rust, fawn-brown, slate-gray, and gray-tweed. 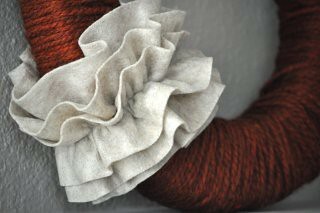 Most of the door sweaters will have an oatmeal colored ruffle on them, but a few will have gray. The door sweaters come in two sizes, 14" and 10". The 14" door sweaters come with a triple-layer ruffle; the 10" door sweaters come with a double-layer ruffle. The give-away will be open until the evening of September 1, 2010. To enter the give-away, simply tell me, in the comment section, what is your favorite thing( s ) about the Fall season. Hi Sarah. I love your door sweaters and it looks like G baby does too! He is adorable! I don't know if I can pick just one favorite thing about fall. I love the crisp, cool air,the beautiful colors, pumpkins, soup for dinner and the start of the holiday season. Thanksgiving is my favorite holiday. Congratulations on 500 posts!! LOVE the door sweaters and think one would look beautiful on my front door :) My favorite thing about the fall season. . .I love so many things about it, but probably going to our local farm and picking out beautiful pumpkins would be my favorite. I love playing in the leaves with my daughter!! I love falling leaves, crunching leaves and just about everything about fall. Cider, hay rides, pumpkins, fall smelling candles!! OH I LOVE FALL!!! I love the crazy, unstructured fun of summer, but Fall is my favorite because life settles down and becomes ordered again. We get to wear our cozy clothes and pick pumpkins and rev up for the holidays. God paints his trees flashy colors for our eyes and a nip in the air for our noses. Oh. And the pumpkin pie. That, too. i do love fall! There's a tie for first place on my list of "favorite things about fall" between Fall Foods and Fall Clothing. BTW, I LOVE the garland you made that Bethany bought for me! Still putting the nursery together, but I'll have to send a pic once it's up. Love, love, love the door sweaters! You are so creative my dear Sarah! They are definitely very "fallish"...one of my favorite seasons! I love the changing colors of the leaves, cool and crisp evenings, pumpkin pie, light sweaters and hoodies...I could go on and on! Hope you guys are doing well. Miss you! can't wait to enter the giveaway! Fall jackets, genuinely needing hot beverages, the air gets lighter,and pretty much anything about fall. Great stuff. I love what you've been doing. pumpkin spice lattes. jeans & sweaters. cool walks. there's so much to love! crunch under my feet, pumpkin spice chai, pumpkin pancakes, that fall smell, the brisk air, jackets and sweaters, the gorgeous trees, Thanksgiving and Christmas are on the way...need I go on? I NEED that for my front door...too cute...I still have up my July 4th thingy :(. As much as I love summer, sunshine, swimming, and blue skies, I do love the cooling off of Fall and all the anticipating and preparations for the holidays. Love that. Congrats on 500! How exciting! I just adore everything about fall! It's a feast for all of the senses! I love, love, love the vivid colors, chatting with friends over a bonfire, the smells of the fall scented candles, and pretty much every single thing about the season! Love the door sweaters! These are the types of things that I like, but could never create myself. :) There are many things to love about Fall. The crisp, cool air. The non-humid, perfectly blue skies. Colorful leaves. The colors of Fall in general. Anything pumpkin. Apple picking. My little guys 1st birthday. :) Fall is my favorite too! Hey Sarah! I love fall flavors, colors, cooler temps, and football. I love the fall for many reasons, but last year I became even more smittin with Fall. My husband and I got married in October AND both of our birthdays are in October! So, we have lots of things to celebrate! I love that we are blessed with God's gift of marriage and get to enjoy all the lovely things fall has to offer!! I don't know if there is anything I do not love about fall. A "few" of my autumnal favorites: sleeping with the window open and waking up to a chilly morning, the smell of smoke coming from the neighborhood chimneys, homemade chai apple cider, crispy leaves that crunch under my feet, the pervasiveness of the orange colors I love so much, and sitting around bonfires in the backyard with hot pretzel rolls in hand. fall is my favorite, favorite! and besides the smell of fires, the cool air, and the gorgeous colors.....it has to be all about candy corns and pumpkins! So creative you are, Sarah! Fall has grown and grown to be my favorite season since moving to Virginia. It means a repreave from the hot and steamy weather (which I'm not a huge fan of), it means sweatshirts & jeans (my favorite combo), and it means my favorite colors displayed inside and out. Fall = cozy! Very cute door sweaters! Very original! I love these! The rust one would be such a beautiful way to welcome people to our home. My favorite things about fall are the crisp air and moments when the wind blows up leaves and suddenly you want to skip and wear sweaters and ride your bike wearing boots, the moments when you want it to stay cool and crisp forever, just so you can enjoy the warmth of chocolate chip cookies and your family and the smell of coffee and pipe smoke. These are so pretty and perfect for fall. I love snuggling my baby in warm clothes. Fall is the bext. cinnamon, hot apple cider and ginger snaps, corn mazes, warm layered clothing and chilly noses, Indian corn and decorative gourds, hay rides, mums, pumpkins, delicious colors that make you want to just slow down and indulge as many senses as possible!